In 1885, seven farmers from the beautiful North German Plains formed Ammerland, one of North Germany’s first dairy cooperatives. The cooperative’s region sits at the very top of Western Germany; a place famous for unspoiled, lush grazing meadows that are so flat they seem to stretch endlessly into the horizon. Over 125 years later, Ammerland has about 2,200 regional members and is one of Europe’s largest and most technologically advanced cheese dairies yet it remains an exclusively farmer-run cooperative, firmly guided by tradition and dedication to quality. 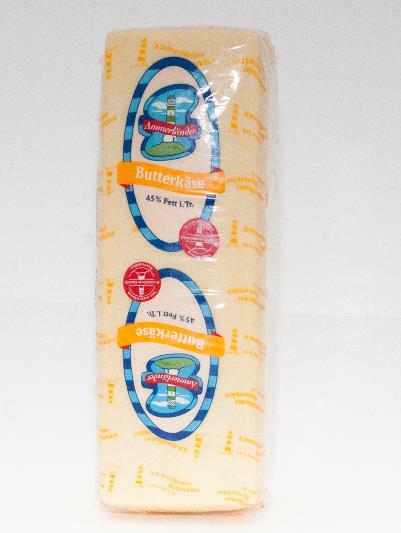 Ammerländer Butterkase, named for its delightful buttery flavor and semi-softness, is produced with quality standards far above permitted regulations. Starting with only the freshest and most pure Ammerland cow’s milk, Ammerländer Butterkase undergoes a brief aging process, typically one month. A natural, edible rind is formed, with a full and hearty (yet mild and delicate) taste, an enticingly smooth, creamy, melt-in-the-mouth texture and an inviting aroma. Butterkase’s wonderfully approachable attributes attract a very broad range of people from children to adults and from more hesitant cheese-choosers to cheese lovers. Application: In addition to savoring Butterkase alone, it can be easily cubed, sliced, melted or spread. Butterkase incorporates without overpowering any accompaniments or other ingredients. It is a great alternative to cheeses some find too strong when preparing dishes such as fondue, and it can even replace butter and sour cream! Butterkase goes exceptionally well with melon, grapes, plums, sausages, ham, burgers, chicken, potatoes, crackers and sourdough bread. Pairing: Beer! Specifically Pilsner or a refreshing pint of lager, but also try Butterkase with Chardonnay or Brandy. Gaeta olives are known as the “Queen” of olives or the “Black Pearl” of Italian olives, but however you call these immensely popular, distinctly flavored little ovals they will add unique, delicious taste to all manners of gastronomic enjoyment. Named Gaeta for the historical seaside town in central Italy’s Lazio region, Gaeta olives have a color spectrum from deep black to pinky rose. Their soft, meaty textured flesh holds a full, pleasantly mellow flavor with a slight salty, citrusy tartness. 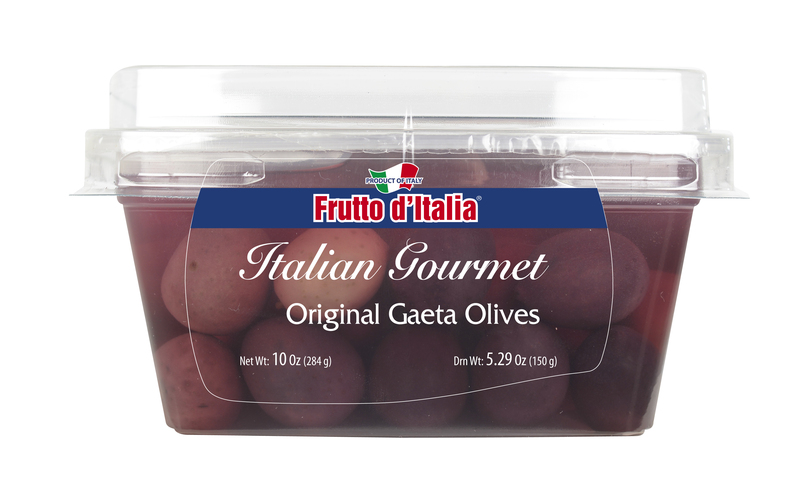 Splendid well beyond table olive enjoyment, Frutto d’Italia Fresh Gaeta Olives add an exceptionally pleasing taste to salads, pasta, as a meat and fish topping, or when pureed for dressings and sauces.